Luxury 2 bedrooms apartment. On the 6th floor with elevator, very bright. Elegantly furnished. Parquet floors, leather sofas. Living room with adjoining kitchen, a double bedroom, a single bedroom, a bathroom, 20 sqm terrace. 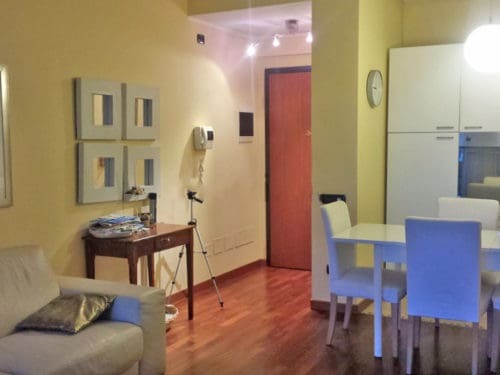 Equipped with every comfort: fully equipped kitchen (dishwasher, oven), washing machine, heating and cooling, basement, inner garden, private garage available on request. Recent building (2002), equipped with video surveillance and concierge. Safe residential area, park front. Near Bocconi University (10 minutes walking), next to the Centro Leoni. Connected by trams 24 and 15. Supermarket Esselunga 10 minutes walking.